What are the depths of the dives and how are they supervised? Non-certified divers can participate in 1-tank dives with a maximum depth of 40 ft after completing a Vallarta Adventures Discover Scuba pool lesson before the day of their dive. Certified divers are automatically entitled to participate in 2 tank dives up to a maximum depth of 60 ft.
Advanced divers can participate in 2 tank dives up to a maximum depth of 120 ft. Supervision is 1 Divemaster to 4-6 diver pairs - buddy system. Although we provide you with all the necessary equipment for your dive, you may bring your own. However, this does not alter the price. Are there any restrictions that may prevent me from scuba diving? Not present any respiratory, cardiovascular or ear problems. Be in good mental and physical condition for diving. Avoid being under the influence of alcohol or drugs while diving. Be over 10 years old, not be pregnant and not fly within a period of 24 hours after a dive. To participate in the El Morro, Corbeteña, Los Anegados or Sequial dives, you must have 25 logged dives shown in your log-book wich you must bring. An Acknowledgement of Risk will need to be signed before participating in any of our dive programs. 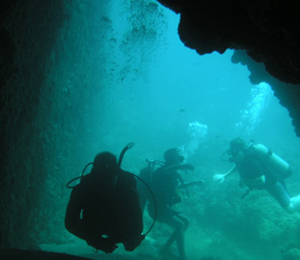 I have been to the Bahamas many times, but Advanced Scuba Expedition is one of my favorite trips! It includes everything that everyone should do here. As a Bahamas veteran, I can say only the best about this experience!